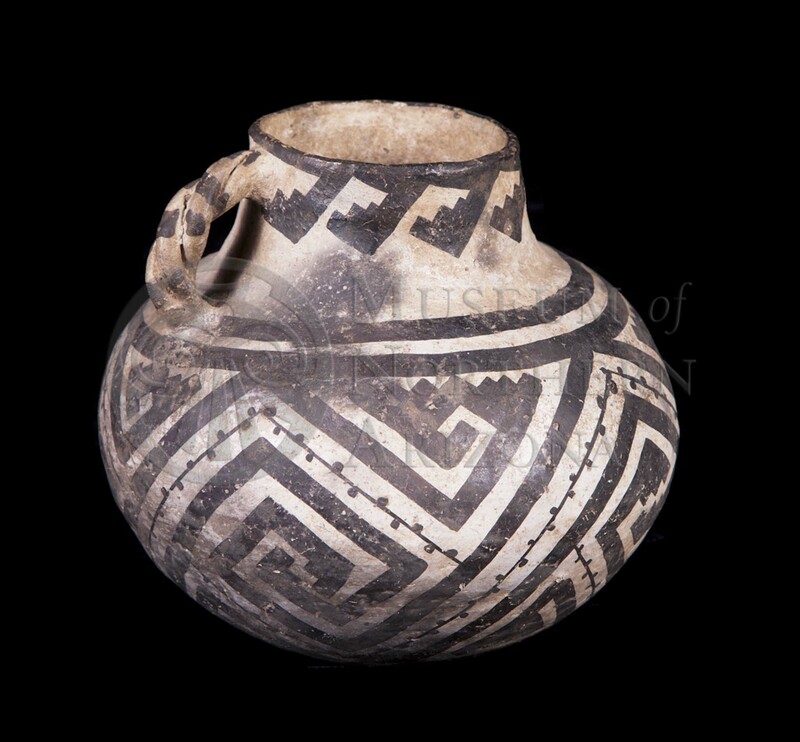 Snowflake Black-on-white pitcher from the Museum of Northern Arizona collections. Click the image to open the Snowflake Black-on-white gallery. Snowflake Black-on-white is type of Cibola White Ware commonly employing stepped elements in rectilinear designs. Date Range: ca. A.D. 1100-1275. Core Color: Dark to light gray. Temper: Fine crushed sherd and/or fine sand. Surface Finish: White slipped and unslipped; well-polished. Forms: Jars, seed jars; bowls relatively rare. Design: Solid bold lines; interlocking rectangular scrolls; stepped sides, not barbed; lacks hatching. Comparisons: Similar to Escavada Black-on-white, but has stepped sides rather than barbed; Reserve Black-on-white is also similar, but has hatched elements; Roosevelt Black-on-white designs are more elaborate; occasionally similar to Sosi Black-on-white, which has carbon-based paint.